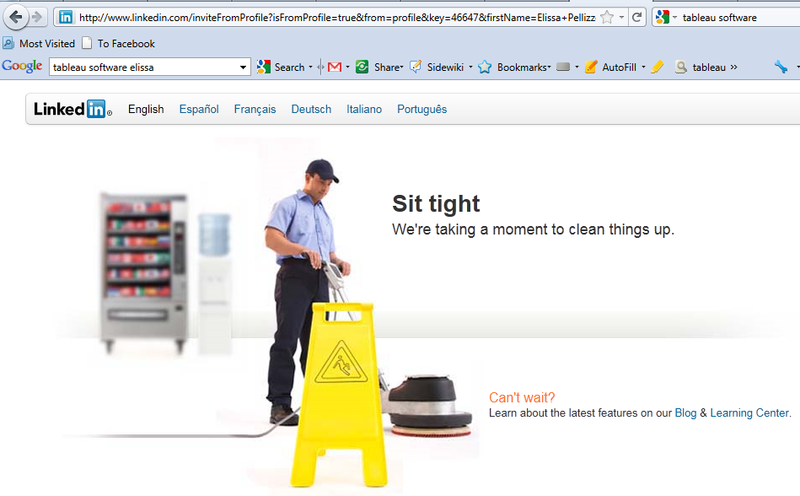 In the course of some routine site browsing at LinkedIn.com yesterday, the error shown above was thrown. It's polite, aesthetically acceptable (if not pleasing) -- even hopeful, but the message implies that one should take no action. Just "sit tight." I struggled to think of an error condition that had visibly recovered itself in a timely way with no interaction required from me. It's possible that some exist, though none came to mind, and my skepticism was rewarded by having this screen remain static for 90 minutes. An auto-refresh might have effected a change, but starting a new session seemed like a better plan. I did reproduce the situation on the same computer with a different browser (and obviously different session), and it too remained static after encountering the error. Self-correcting errors -- even user-advised self-correcting errors -- are not unheard of, and this may have been one of them, but any correcting that took place was not visible to this visitor.